The Adjutant Press is the final adhesive application equipment used in Gluefast’s efficient large mounting system to ensure a wrinkle-free bond. 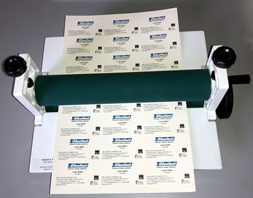 Effectively eliminating air bubbles or wrinkles, the Adjutant Press is suitable for a broad range of adhesive applications such as labeling or print, poster, and photo mounting in industrial and commercial operations. 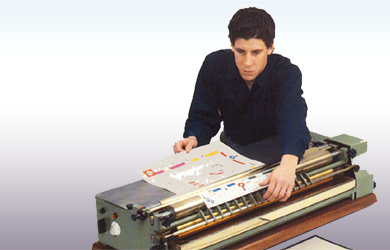 After running the board stock, label, print, poster, or photo through the Colonel Gluer, the combined paper and board stock is positioned together and fed through the Adjutant Press. 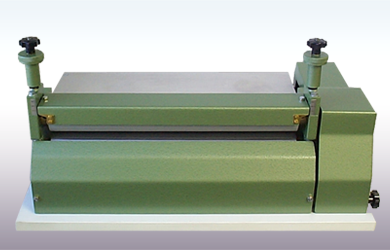 This adhesive applicator applies uniform pressure to the materials being mounted. When complete, the mounted piece is then placed in a stack to dry. 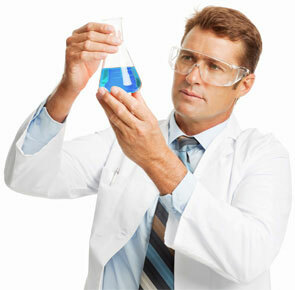 Even pressure is an important aspect in adhesive labeling and mounting applications. 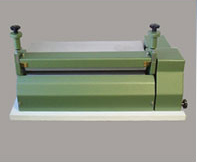 By applying adequate pressure, the mounting press helps squeeze out air between the adhesive, paper, and mounting board for a strong bond and a professional appearance. Whether you are mounting a substrate to a mat board, foam core, or other board stock, the Adjutant Press system can be adjusted to apply just the right amount of pressure to get the job done. When the Colonel gluer, Adjutant Press, and our lay flat glue products (such as GF #637U glue and GF #878U adhesive) are used in combination, the final result is a team of “Wrinkle Tamers” that cannot be beat! The Adjutant Jr. presses the glued sheets together, insuring excellent contact and eliminating any air bubbles. 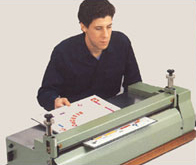 This non-motorized press handles paper widths up to 14” wide. 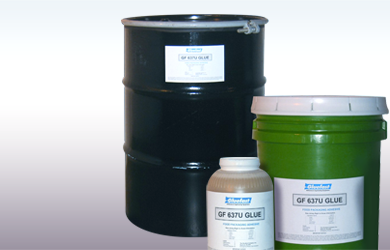 Contact a Gluefast representative at 800-242-7318 or email us and let us lend our extensive experience in the adhesive application industry to help you determine if this adhesive mounting system is right for you.